The Spanish Steps. This was the most important square and the heart of the old Papal Rome; it takes its name from the Palace of the Spanish Ambassador which rises in the West side of the square. Before the new part of the city was built, it was the English and American quarter and was surrounded by the best hotels. In the centre of it is the fountain of “Barcaccia” work of Pietro Bernini, said to commemorate the great flood of 1598 and to mark the spot where a boat was left by retiring waters. 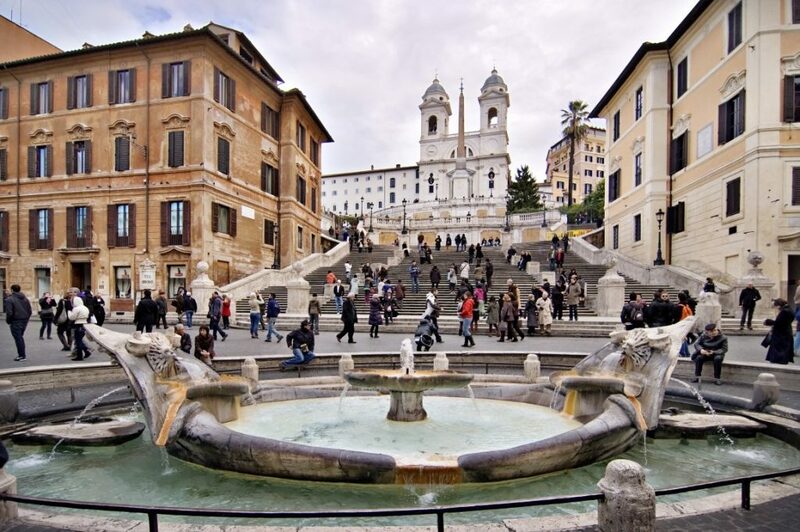 Opposite the fountain is the staircase of the “Trinità dai monti” built at the private expenses of the French Ambassador Stephen Gouffier, who died in Rome in 1660. It was begun with designs of the architect Specchi and completed, under the reign of Benedict XII, by the architect De Sanctis in 1725. Up to a few years ago, on the steps, models dressed in their fancy dresses and brilliant colours, used to station to be hired by painters. Memorial House of Shelly and Kids where this latter poet lived, during his residence in Rome, and where he died on February 24th 1821. The building was recently bought by a subscription made among the numerous admirers of the two great poets and is now used as a little memorial house. It contain a library and a little museum of souvenirs of the two great men. Guide of Rome. Rome city tours for groups or individuals!!! !